The Coq de Leon Hen Caddis: yes, a dry (ok, damp) fly made of hen instead of rooster hackle. It has soft contours and uses materials that suggest the movements of an insect struggling to break free. In the Leeson/Schollmeyer book, Tying Emergers, they say that an emerger is not a specific fly, it’s a stage in the life of a bug. That is why they advocate soft contours and materials that suggest the movements of an insect struggling to break free. 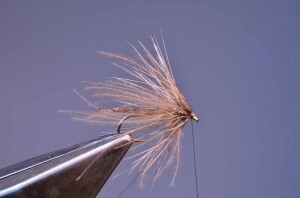 This Coq de Leon Hen Caddis Emerger does just that, and it uses some unique properties of Coq de Leon Hen neck hackle: it is less stiff than dry fly rooster hackle, has less web than regular hen hackle, and it has that typical glassy, speckled look of Coq de Leon rooster hackle. 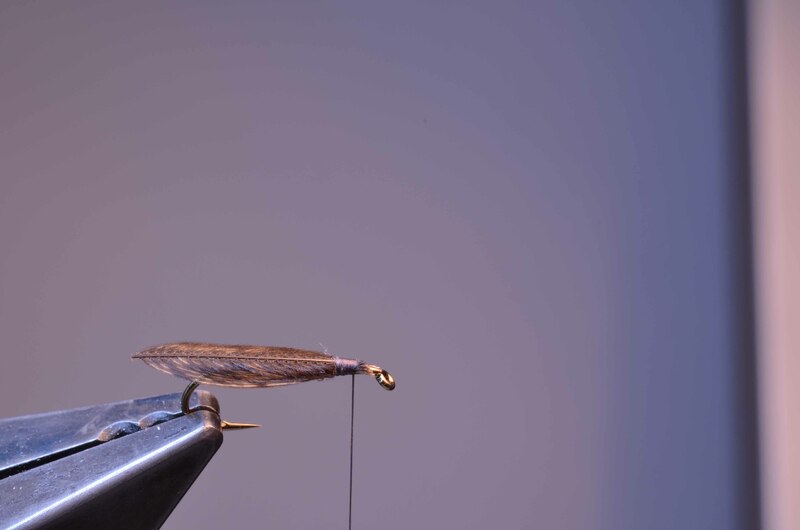 I fish this fly on trout and grayling streams, late in the afternoon until dark. The fly is taken by trout and grayling, and – reportedly – arctic char. I can’t tie enough of these flies for Skuli, a friend from Iceland. He is a fishing guide there, and swears that this is the best Needle Fly he has ever fished… Don’t know if that’s a compliment for a caddis pattern though. Anyway, he normally uses nymphs for arctic char but he noticed that they rise to get this fly. Lay down a thread base, starting behind hook eye, advance thread to the point above the barb of the hook. Dub a thin body, tapered at the back and the front. The front of the body ends at 2/3 of the hook shank. Take a larger Coq de Leon hen neck hackle from higher up the neck. Assuming you are a right-handed tier, take the hackle by the tip of thumb and index finger of your left hand, pinch the other side between thumb and index finger of your right hand. 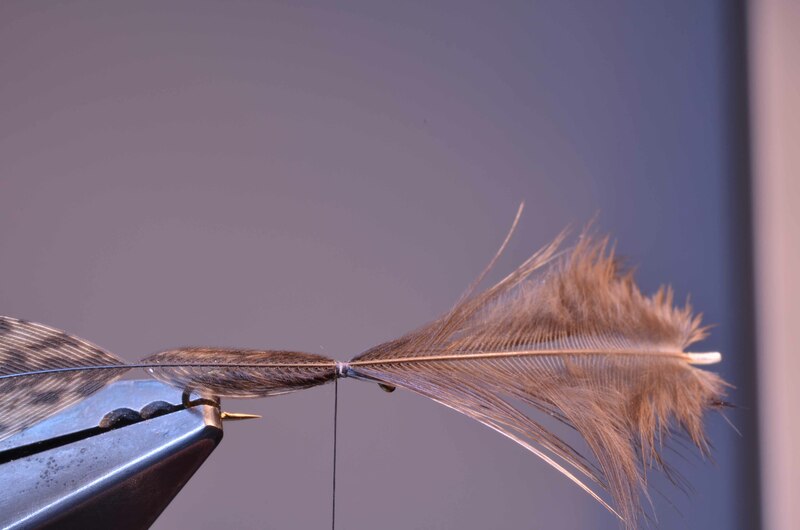 Pull the tip of the hackle with your left hand and slowly pull the hackle through thumb and index finger of your right hand, preening the barbs back to the base of the feather. You will see a flatwing forming, with the barbs aligned side by side. Continue until you have a wing that extends behind the hook bend 1/3 of body length. Without changing your right hand grip, lay the flatwing on top of the tapered front part of the body. 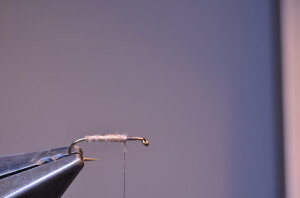 I always lay down the wing just a little bit on my side of the hook: the thread pressure will pull the wing perfectly into place, right on top of the hook shank. With your left hand, make two firm thread wraps. 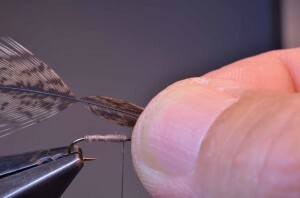 Now you can let go of your right hand, and make one more thread wrap to secure the wing. Make one anchoring wrap around the hook shank. Then cut the stem and barbs, and cut off the tip of the hackle. 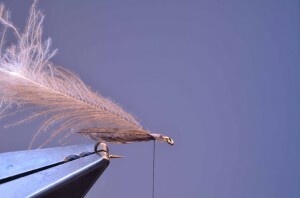 Take a CDC feather by the tip with your right hand, pull back the barbs with your left hand. Cut off most of the tip of the feather, leaving a small triangle of stem and some barbs. Tie that in just in front of the flatwing, still on the tapered front part of the body. Take a CDC feather by the tip with your right hand, pull back the barbs with your left hand. Cut off most of the tip of the feather, leaving a small triangle of stem and some barbs. Tie that in just in front of the flatwing, still on the tapered front part of the body. 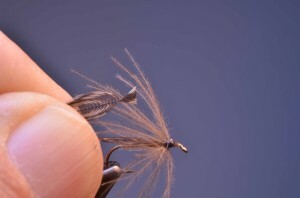 Lift the CDC feather, stroke all fibers back and make three closely spaced wraps. Ensure that the barbs point to the bend of the hook. Tie down and cut CDC feather. Take a Coq de Leon hen neck hackle by the tip with your right hand, pull back the barbs with your left hand. Cut off most of the tip of the feather, leaving a small triangle of stem and some barbs. Tie in just in front of the CDC hackle. 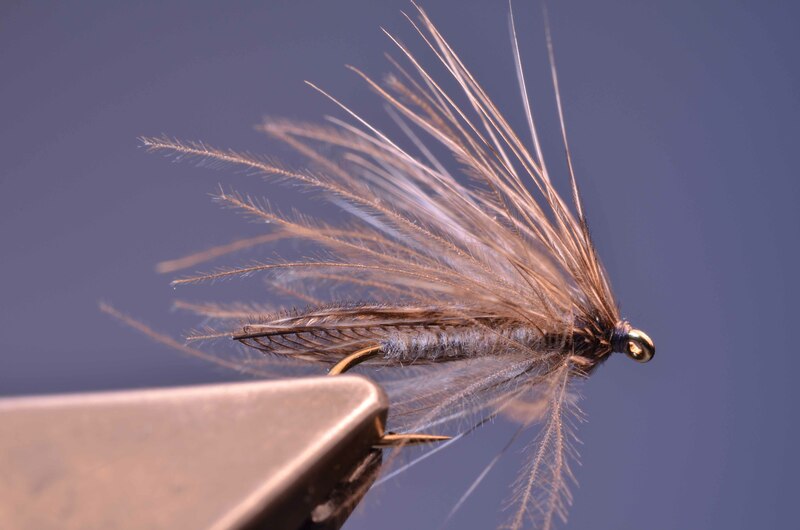 Lift the hackle, preen the barbs back, make three or four wraps. 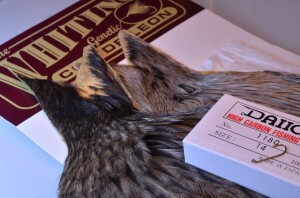 Tie off the hackle with two thread wraps. Take the bobbin in your left hand, pull to keep tension on your thread, and twist the hackle by the stem. If will break clean off. Make two thread wraps and whip finish. Cut off most of the Coq de Leon hackle at the underside of the fly. Don’t cut it completely flat but leave some stubs. Try not to cut any CDC barbs.